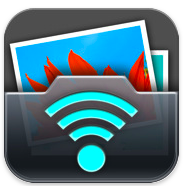 Apple’s iCloud service facilitates media sharing between iOS devices and computers, but doesn’t offer the transfer features of PhotoSync. PhotoSync is flexible, powerful, and straightforward to use. The following 72 second video provides an overview of PhotoSync’s features and capabilities.